Grey's Anatomy Round Table: "Rise Up"
McCritic: Like my new favorite character, Dr. Hunt, allow me to be serious for a moment: I appreciated his intense approach to patient care when he yelled at Karev for carelessly treating a patient: "What you did was treat a man who's fighting to live like he's already dead. You have no sense, no decency and no respect!" missingBurke: It was more of a sequence than a specific quote, but I loved the Chief operating the robo-patient and messing with George. LOL. iheartizzie: Given the events of the past week, I found Erica telling Callie "there is no gray area here" a little ironic, because clearly when it comes to network execs determining what's taboo and what isn't, that Grey area is pretty massive. 2. Denny: We want more, or enough is enough? 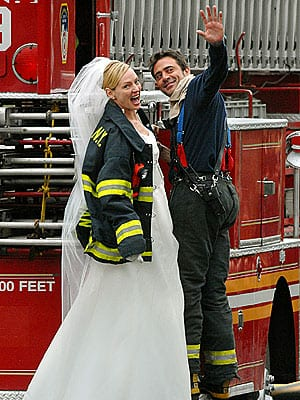 iheartizzie: I love Denny, and always have, but is this the third time he's been back since the Season Two finale? At some point, Izzie and Shonda both have to let it go. McCritic: Enough! Jeffrey Dean Morgan is starring in Watchmen next year. The guy isn't in need of work. 3. If Cristina is a single malt scotch, what types of booze are some of the other characters? missingBurke: Lexie Grey = Bud Light. Doesn't strike you as a quality product first, but after awhile, you get used to it and start enjoying it. McCritic: Alex Karev is Heineken, an acquired taste. Meredith is tequila, she makes me wanna vomit. Bailey is rum and coke, she keeps you on your toes. Derek is a strawberry daiquiri with a pineapple slice, cherries and an umbrella, he's pretty to look at. iheartizzie: To me, Mark Sloan is a like fine Knob Creek bourbon. Just the right amount of bite, but so, so smooth. 4. Will Mark Sloan ever get a substantive story line? If so, what? McCritic: Yes. He's gonna date Callie. iheartizzie: I think Erica's controversial departure may have paved the way for Mark and Callie, which may make George the new Mark. When is Dr. O'Malley going to do something interesting? Even his friendship with Izzie has become non-existent. missingBurke: With so many Grey's Anatomy cast members, Mark seems to be relegated to comic relief. He's great at it, but he has to take on something significant eventually. Right? I'm hoping Addison's return will spice things up for Mark. 5. Are you happy Erica Hahn is gone? iheartizzie: Absolutely not. I thought she meshed well with the rest of the characters, and the motives behind her departure and the breakup of Callica are highly questionable. missingBurke: I think firing Brooke Smith was too extreme, but at the same time never got a good vibe from Hahn and think overall chemistry may improve going forward. McCritic: No. Heaven forbid a full-out lesbian is allowed to become a main character. 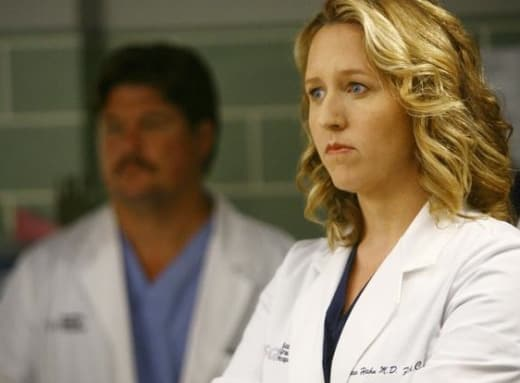 Dr. Erica Hahn (Brooke Smith) will be missed by many Grey's Anatomy fans.